I recommend that patients with mental health challenges and/or family history of mental illness exercise caution when using medical cannabis, and see an experienced medical provider for specific guidance on how best to treat your condition and decrease the risk of adverse psychiatric effects. Many patients with mental health challenges find relief from medical cannabis. Patients report improvement in depression, anxiety, bipolar, PTSD, ADD/ADHD, Tourette’s syndrome, Alzheimer’s dementia, and other psychiatric conditions. Conversely, cannabis can also worsen psychiatric conditions in some people and even hasten the onset of mental illness in predisposed individuals. It all depends on the individual’s current internal state and the way in which they use cannabis. There is no cookie-cutter approach that will work for everyone. The most important strategy is to avoid building tolerance to THC and to use the Sensitization Protocol, 6 day program periodically – this will keep your endocannabinoid system functioning optimally so it can help keep your nervous system in balance. As mentioned above, cannabis can both relieve and exacerbate anxiety. Using a low dosage, choosing a strain known to relieve anxiety (including CBD strains), and using a delivery system with slower onset (e.g. tincture) can prevent this negative side effect. Inhaled cannabis can increase heart rate and stimulate the sympathetic (fight or flight) nervous system, and many patients with anxiety have reported that when they inhale, they sometimes get an initial, brief increase in anxiety followed by lasting relief. Anti-anxiety effects of THC-dominant cannabis are more likely in people who are long-term users, and when using cannabis in a familiar, comfortable environment. A THC overdose can cause anxiety and even panic attacks, even in people with a lot of experience using cannabis. I’ve also noticed that approximately 2% of my patients are very sensitive to the anxiety-causing aspects of THC – these people do better with more CBD content. Selecting the right strain can make a big difference in treating anxiety. I also often recommend combining cannabis with Lemon Balm (available in tincture, tea or capsules) for it’s synergistic anti-anxiety effects. Many patients with Hepatitis C experience nausea, pain, and other symptoms that are relieved by medical cannabis. Research shows us that cannabis could both help and harm the liver in people with hepatitis C, depending how it’s used. 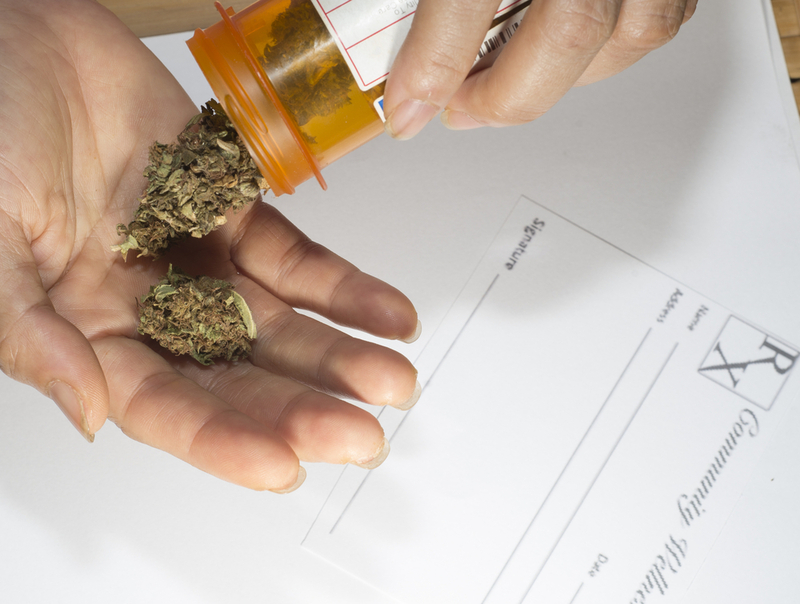 High doses of THC have been associated with increased scarring in the liver (fibrosis) in patients with Hepatitis C who have active inflammation and scarring already present.1 This effect has not been shown in Hep C patients without active inflammation and scarring.2 The current status of the liver can be determined with invasive liver biopsy or a non-invasive blood test. Until recently, the conventional treatment for hepatitis C required a very long course of IV medications that cause numerous side effects. Patients who underwent this treatment (interferon, ribavirin, etc.) were more likely to successfully complete and respond to their treatment if they were concurrently using medical cannabis. The take-home message for patients with hepatitis C is to seek strains of cannabis that are CBD-dominant and always use the minimal effective dosage of cannabis by keeping their cannabinoid system sensitized. Healer’s programs can help you find your lowest effective dosage. For a review of the evidence on cannabis use in pregnancy, please see the “Health Effects of Cannabis” section on reproduction. Maternal stress, including pain and anxiety, and malnutrition are well known to increase the likelihood of adverse outcomes in pregnancy, and in some situations the potential benefits of using cannabis to treat a pregnant patient may outweigh the risks. If you are pregnant, please work with a medical provider who is knowledgeable about cannabis to help determine if it is the safest treatment for your condition. Non-smokable delivery methods should always be used to avoid exposing the fetus to carcinogens and other products of combustion. 1 Ishida, Julie H., et al. “Influence of cannabis use on severity of hepatitis C disease.” Clinical gastroenterology and hepatology 6.1 (2008): 69-75. 2 T Liu, GT Howell, L Turner, K Corace, G Garber, C Cooper. Marijuana use in hepatitis C infection does not affect liver biopsy histology or treatment outcomes. Can J Gastroenterol Hepatol 2014;28(7):381-384. 3 Lim, M. P., L. A. Devi, and R. Rozenfeld. “Cannabidiol causes activated hepatic stellate cell death through a mechanism of endoplasmic reticulum stress-induced apoptosis.” Cell death & disease 2.6 (2011): e170.